Found 3 file extension associations related to Crescendo and 1 file format developed specifically for use with Crescendo. Crecendo is a simple and intuitive way to write musical notation, Crescendo allows you to create, save and print your music compositions on your computer. The wide array of notation symbols, time and key signatures, and text, all on a free-form layout, give you the most control over your music arrangements. This program is perfect for composing original songs, music, scores and soundtracks, or you can try it with TwelveKeys music transcription software to transcribe music recordings and notate arrangements of your favorite music. Crescendo is completely free. 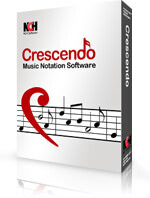 We hope you will like Crescendo so much that you will try our other software for musicians and audio software suite for a complete set of audio tools. If you need more information please contact the developers of Crescendo (NCH Software Pty Ltd), or check out their product website.